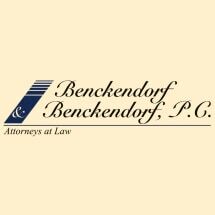 Benckendorf & Benckendorf, P.C., has served Central Illinois since its inception in 1981. With over 63 years of combined legal experience, the firm offers a broad range of sophisticated legal services, encompassing almost every area of general civil practice, in a small firm setting. We have locations in both Peoria and Morton, with attorneys available in either office for consultation. Our Morton office offers a full spectrum of services for real estate transactions, including contract preparation, legal counseling, title insurance and transaction closing. Our ability to render a comprehensive scope of legal services stems from an innovative combination of technology, experience, training and business activities. The firm has both a print and CD-ROM library with access to a wide range of up-to-date research materials and planning aids. This collection is supplemented by access to various on-line electronic libraries with a greater range of materials. Our staff receives periodic training in the various technologies that we have implemented to provide our clients more prompt and efficient service. Over the years, our attorneys have counseled thousands of clients, both individuals and businesses. We have experience in a wide range of legal services, including estate and business planning, litigation at both trial and appellate levels, corporate and business organization, domestic issues, all aspects of real estate transactions, and estates. Our attorneys' knowledge and experience continues to grow through their attendance at continuing legal education seminars and their involvement in local business and community activities. The firm continues to evolve in order to better to serve our current and future clients. Morton Community Bank, Century 21- Lincoln National Realty, Village of Mapleton, Illinois, BitWise Systems, Inc., 4-B Elevator Components, Ltd., MCP Incorporated, Focus Investments, Ltd.
Our offices are located at 101 NE Randolph Avenue, on the corner of North Street and Randolph Avenue one building from the top of the Main Street hill.